The Acne Advanced Treatment System is a unique collection of at-home and in-spa products that utilize natural and botanical actives to deliver a proven organic solution for those looking to treat and prevent acne. 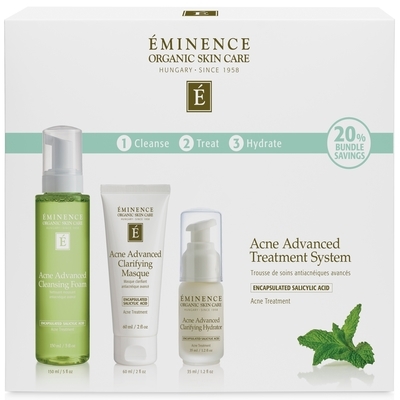 Give your skin the clean slate it deserves and reclaim a clear complexion with this effective system from Eminence Organic Skin Care. 3-step system plus a professional peel designed to treat and prevent acne. Utilizes a combination of time-release encapsulated salicylic acid and powerful natural and botanical actives. Proactively prevents against future breakouts.